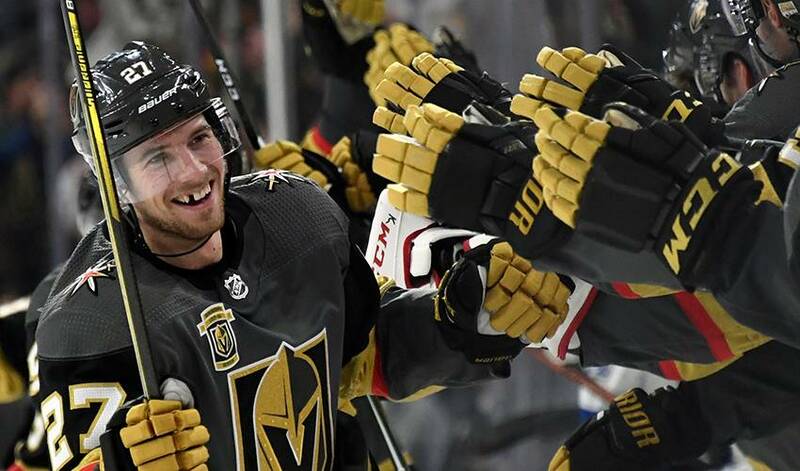 LAS VEGAS — Defenceman Shea Theodore ended his holdout Monday night, agreeing to a seven-year contract with the Vegas Golden Knights. "We're happy to have everybody done now, sometimes it takes a little bit longer than anticipated," Vegas general manager George McPhee said. "He's a good young player and we got some unrestricted years and now he can just play." McPhee said the main issue between the team and Theodore's camp was the Golden Knights were asking him to sign long-term, while the fourth-year pro was looking for a two-year deal. McPhee also said the long-term deal was about managing the salary cap properly, and leaving enough space over the next few years, giving the Golden Knights a better chance to continue as a Western Conference contender. "I think when it was laid out and explained to the player why we were doing that ... he bought in," McPhee said. "You just have to get the numbers right on those deals. We thought if we paid a little more now ... and we have cost certainty in the future, it allows us to manage the cap better, and plan better. "We got to a place today where they had a couple of options — a six-year deal, a seven-year deal — we thought we were pretty close, and got it done just after the first period." "We were pretty confident, based on the way he played last year and what he did at his age last year, to really play that well, and play that well in the playoffs for four rounds, we're pretty confident about what we're gonna have now, and in the future," McPhee said. "So, we were prepared to go longer." Vegas coach Gerard Gallant said Theodore will join the team Tuesday, during a two-day retreat in Montana. He added that he is not concerned about the time he's missed during training camp. "He's been working out, he'll be fine," Gallant said.